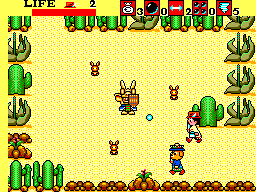 The object of the game is to reach the Aztec Paradise through 11 dangerous stages fighting enemies and boss demons. 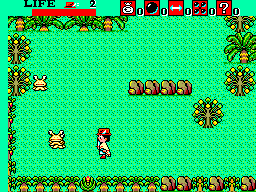 You get 2 or more boss demons in every stage, such as Masked Rabbits, Monster Flowers, Rock Lions, Ranbaikes, Watermen and Bats. You can easily boycott these monsters and continue to the end of the level but you can only unlock the gate to the next stage by killing all boss demons. On top of these you have a whole array of other creatures and obsticles there to ruin your day! I found that the design of these enemies in the game are so imaginative. In order to make your way through the stages killing enemies and passing obsticles you have to pick up weapons and special items on the way. Nino will always be equipped with his trusty sword as a weapon. But you can have other items to help you on your way, such as: different types of iron balls to throw at enemies from a distance, arrows for killing stronger enemies, special items that is different from stage to stage. These special items are: Fireballs for burning trees and killer plants in your way, Boots for crossing rivers without loseing life, Tornados for wipeing out many enemies at once, Lightning bolts that kills any enemy that comes near you, and finally Dynamite.. for making explosions to kill enemies and other deeds. One thing about this game that I find unique to this game from any other Master system game ive played, is bribeing eneimies. Along the route, you can collect money and use it to bribe certain enemies that would potentially attack you. After the bribe they will help you along the way, killing other enemies for you., but alas, they themselves can also be killed. These things are what attracted me to the game, all nice little concepts, original ideas and imaginative. All three to me make a wonderful game. Graphics in this game are indeed very good for a 1987 game. The style is very simelar in many ways to Golvellius with regards to the 'birds eye' view over the game. You can move Nino left, right, up, down and in all diagonal directions, whilst destroying enemies in your path with your sword or other limited weapons you might have picked up along the way. The design of things such as enemies and landscapes are detailed and imaginative, and nice texture and use of colour, its just about right, not to bright and not to dull and boring. However, levels 6-10 are the same design landscape as levels 1-5, but levels 6-10 are a different route and incresed difficulty, and more Boss Demons. So it isnt that bad that the landscapes are repeated. Another thing that i like about the games graphics and general running of the game is that it is very smooth and clear. You can move around the levels and from scene to scene with fluidity rather than the scrappiness of control over charecters in some of the earlier games, and charecters are large, well defined and detailed. The only thing that i think could be better about graphics and design in the game is perhaps the repetition of the first five levels. When i was a child i remember getting past the first 'Ruins' stage (level 5).. wondering what would come next.. and it was just a repeat of design from an earlier level, i was a bit dissapointed. But as i said the increased difficulty and changed layout of the later levels do make it acceptable, unlike the repatition of 'alex kidd : the lost stars' for example. All in all the graphics are pretty good in my opinion. The music in the game is great, I find it is quite cheery and happy, yet somewhat repetative although the tunes themselves are quite nice and have a sort of 'feel good' thing about them. I personally find myself occasionly humming or whistleing the music for this game, because its the cheery sort that you will remember and enjoy for a long time. In the game there is 6 types of music that will play during the levels. Five different compositions will play in each of the first 10 levels. As i stated the first five levels style and design are repeated so therefore the music is too, so each composition is played twice. Level 11 'Phantoms Shadows' has its own creepy piece of music that appears in no other level. My personal favorate music piece in the game is the piece that is played with the two 'Marsh' stages, its cheery and makes me smile a bit :-) . There is also fun and cute tunes played on the intro to the game, the screen between levels that shows your score etc, and the scene when you finish the game all have their own pieces of music. The sound effects in this game are in some ways a bit poor compared to other qualities that this game has. One example would be the sword sound, when you slash at an enemy with your sword, the sound it emits isnt a very good sound for a sword! lol. When you destroy an enemy it will make a 'pop' sound and will leave something behind for you to collect (be it a weapon, special item or a weapon). All items make the same sound when you collect and when you use them, there could be a bit of variety to make it better. Normal enemies that you find en route will not make any sound, but the boss demons do, such as when they fire at you or something. In my opinion the sound effects could be better but the music the game is very nice. The peripherals that may be used whilst playing Aztec Adventure are the control pad or the control stick. I use the control pad whilst playing this game as a matter of preference. You can move Nino around the screen (which is a birds eye view) useing the D pad or the control stick in all 8 directions, up and down the screen, left and right across the screen and all diagonal directions. The control is very smooth, responsive and always instant. Button 1 is used to start the game and to select what item / weapon you wish to use during gameplay. There are five boxes on the top of your screen, one for each of the items you can find in that level. You use button 1 to select which you need by pressing it untill the white box highlights the image of the item you wish to select, When you have highlighted your selection, press button 2 in order to throw it in the direction Nino is faceing. When no item has been selected, pressing button 1 has no effect and pressing button 2 operates Nino's sword, which is infinate and will never run out.. like Alex Kidd's punch. My opinion of the contols of the game is good. However efficiency of selecting items with button 1 and then useing them during the game takes some getting used to especially in tricky situations, but once you have played the game for a while and gained experience, it tends to come very easily and becomes second nature. The replay value for this game to me is pretty high. I always have a go now and then. Its a very enjoyable game to me and I often find myself looking through my collection for something to play then cant resist playing this one whenever I see it or think about it. I think its a combination of the good, smooth running gameplay, the nice happy music that comes with every level, the imaginative, inventive and interesting designs and graphics and the nice innocent story make it an all round very fun and enjoyable game to play. Also to me of course the childhood memories and nostalgic value that accompanies this game whenever it starts up. I always enjoy a bash on it although ive played it countless times and completed it a small number of times. 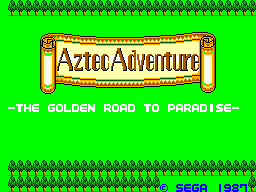 Aztec Adventure. This game is one of my all time favorates. Definatley in my top five favorate Master System games. Since I first played it alot back in about 1993, I missed it and was always on the look out for a copy in second hand shops, but never had any luck finding it. I finally got my own copy in about 2002 when I discovered Ebay. I found that not many people back in the day owned this title. I think its a great game, a true classic overlooked by many people and not owned by some. If you are one of these people; I suggest you dig it out and give it a good go. And if you dont own it, Buy yourself a copy!! This game is not that sought after or expensive really, so you could pick up one for pretty cheap. In my opinion it would be money well spent for this little gem. The game itself is fairly difficult and long for a non-saveing game, so there is an always good element of challenge about it, these factors are what usually attracts me to a game. It is not the kind of game you will complete after owning a copy for a short while. I heartily recommend this game to anyone and everyone.